I apologize for not having a more robust introduction here. My week’s been chopped up by concern with the health of the older of our rabbits. Today’s proved to be less alarming than we had feared, but it’s still a lot to deal with. I appreciate your kind thoughts. Thank you. Meanwhile the comics from last week have led me to discover something really weird going on with the Mutt and Jeff reruns. 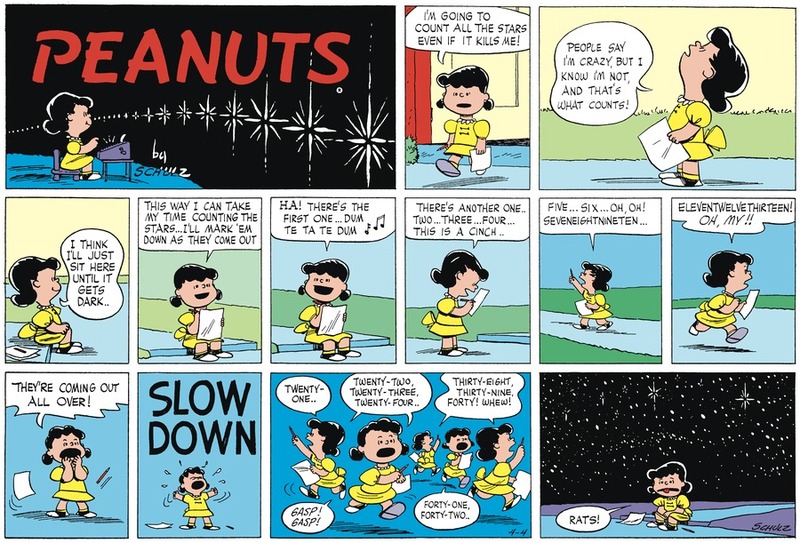 Charles Schulz’s Peanuts Classics for the 6th has the not-quite-fully-formed Lucy trying to count the vast. She’d spend a while trying to count the stars and it never went well. It does inspire the question of how to count things when doing a simple tally is too complicated. There are many mathematical approaches. Most of them are some kind of sampling. Take a small enough part that you can tally it, and estimate the whole based on what your sample is. This can require ingenuity. For example, when estimating our goldfish population, it was impossible to get a good sample at one time. When tallying the number of visible stars in the sky, we have the problem that the Galaxy has a shape, and there are more stars in some directions than in others. This is why we need statisticians. Charles Schulz’s Peanuts Classics for the 6th of July, 2018. It originally ran the 4th of April, 1954. 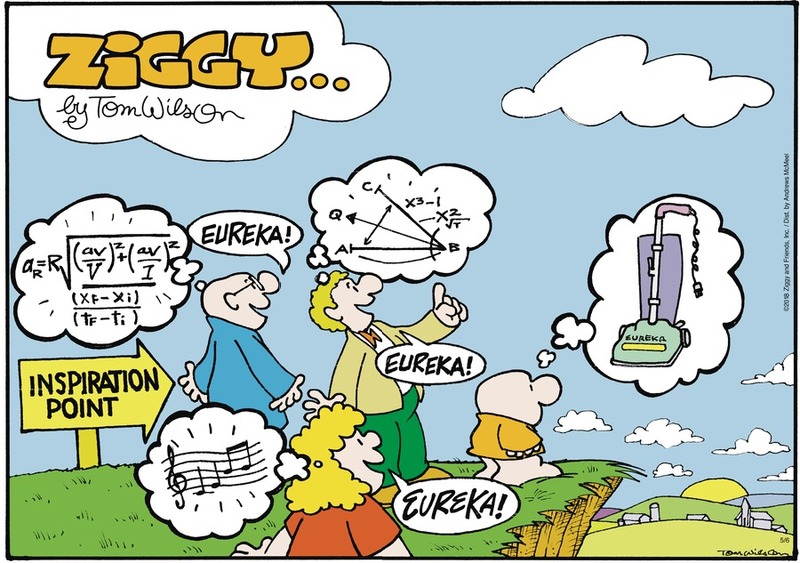 That is an adorable little adding machine and stool that Lucy has in the title panel there. Zach Weinersmith’s Saturday Morning Breakfast Cereal for the 6th looks initially like it’s meant for a philosophy blog’s Reading the Comics post. It’s often fruitful in the study of ethics to ponder doing something that is initially horrible, but would likely have good consequences. Or something initially good, but that has bad effects. These questions challenge our ideas about what it is to do good or bad things, and whether transient or permanent effects are more important, and whether it is better to be responsible for something (or to allow something) by action or inaction. It comes to mathematics in the caption, though, and with an assist from the economics department. Utilitarianism seems to offer an answer to many ethical problems. It posits that we need to select a primary good of society, and then act so as to maximize that good. This does have an appeal, I suspect even to people who don’t thrill of the idea of finding the formula that describes society. After all, if we know the primary good of society, why should we settle for anything but the greatest value of that good? It might be difficult in practice, say, to discount the joy a musician would bring over her lifetime with her performances fairly against the misery created by making her practice the flute after school when she’d rather be playing. But we can imagine working with a rough approximation, at least. Then the skilled thinkers point out even worse problems and we see why utilitarianism didn’t settle all the big ethical questions, even in principle. Zach Weinersmith’s Saturday Morning Breakfast Cereal for the 6th of July, 2018. Confess I’m not sure the precise good-maximization reversal of this. I suppose it’s implying that the baker is refusing to give bread to starving people who can’t pay, and the hungry could alleviate the problem a while by eating the rich? The mathematics, though. As Weinersmith’s caption puts it, we can phrase moral dilemmas as problems of maximizing evil. Typically we pose them as ones of maximizing good. Or at least of minimizing evil. But if we have the mechanism in place to find where evil is maximized, don’t we have the tools to find where good is? If we can find the set of social parameters x, y, and z which make E(x, y, z) as big as possible, can’t we find where -E(x, y, z) is as big, too? And isn’t that then where E(x, y, z) has to be smallest? And, sure. As long as the maximum exists, or the minimum exists. Maybe we can tell whether or not there is one. But this is why when you look at the mathematics of finding maximums you realize you’re also doing minimums, or vice-versa. Pretty soon you either start referring to what you find as extremums. Or you stop worrying about the difference between a maximum and a minimum, at least unless you need to check just what you have found. Or unless someone who isn’t mathematically expert looks at you wondering if you know the difference between positive and negative numbers. Bud Fisher’s Mutt and Jeff for the 7th of July, 2018. So I found a previous iteration of this strip, from the 21st of February, 2015. They had relettered things, changing the wording slightly and making it overall somehow clunkier. The thing is, that 2015 strip looks to me like it might be a computer-lettered typeface too; look at the C’s, and the little loops on top of the letters. On the other hand, there’s some variation in the ? marks there. I understand relettering the more impenetrable old strips, especially if they don’t have the original material and have to go from archived newspaper prints. But the 2015 edition seems quite clear enough; why change that? Bud Fisher’s Mutt and Jeff for the 7th has run here before. Except that was before they redid the lettering; it was a roast beef in earlier iterations. I was thinking to drop Mutt and Jeff from my Reading the Comics routine before all these mysteries in the lettering turned up. Anyway. The strip’s joke starts with a work-rate problems. Given how long some people take to do a thing, how long does it take a different number of people to do a thing? These are problems that demand paying attention to units, to the dimensions of a thing. That seems to be out of fashion these days, which is probably why these questions get to be baffling. But if eating a ham takes 25 person-minutes to do, and you have ten persons eating, you can see almost right away how long to expect it to take. If the ham’s the same size, anyway. Olivia Jaimes’s Nancy for the 7th of July, 2018. There’s some real Old People Complaining in the comments, by the way, about how dare Nancy go sassing her elders like that. So, if you want to read those comments, judge wisely. Olivia Jaimes’s Nancy for the 7th is built on a spot of recreational mathematics. Also on the frustration one can have when a problem looks like it’s harmless innocent fun and turns out to take just forever and you’re never sure you have the answers just right. The commenters on GoComics.com have settled on 18. I’m content with that answer. Care for more of this? You can catch all my Reading the Comics posts at this link. Essays with Saturday Morning Breakfast Cereal content are at this link. Essays with Peanuts are at this link. Those with Mutt and Jeff are at this link. And those with Nancy are here. Thank you. If there was one major theme for this week it was my confidence that there must be another source of Jumble strips out there. I haven’t found it, but I admit not making it a priority either. The official Jumble site says I can play if I activate Flash, but I don’t have enough days in the year to keep up with Flash updates. And that doesn’t help me posting mathematics-relevant puzzles here anyway. Mark Anderson’s Andertoons for January 29th satisfies my Andertoons need for this week. And it name-drops the one bit of geometry everyone remembers. To be dour and humorless about it, though, I don’t think one could likely apply the Pythagorean Theorem. Typically the horizontal axis and the vertical axis in a graph like this measure different things. Squaring the different kinds of quantities and adding them together wouldn’t mean anything intelligible. What would even be the square root of (say) a squared-dollars-plus-squared-weeks? This is something one learns from dimensional analysis, a corner of mathematics I’ve thought about writing about some. I admit this particular insight isn’t deep, but everything starts somewhere. Norm Feuti’s Gil rerun for the 30th is a geometry name-drop, listing it as the sort of category Jeopardy! features. Gil shouldn’t quit so soon. The responses for the category are “What is the Pythagorean Theorem?”, “What is acute?”, “What is parallel?”, “What is 180 degrees?” (or, possibly, 360 or 90 degrees), and “What is a pentagon?”. Terri Libenson’s Pajama Diaries for the 1st of February, 2017. You know even for a fundraising event $17.50 seems a bit much for a hot dog and bottled water. Maybe the friend’s 8-year-old child is way off too. Terri Libenson’s Pajama Diaries for the 1st of February shows off the other major theme of this past week, which was busy enough that I have to again split the comics post into two pieces. That theme is people getting basic mathematics wrong. Mostly counting. (You’ll see.) I know there’s no controlling what people feel embarrassed about. But I think it’s unfair to conclude you “can no longer” do mathematics in your head because you’re not able to make change right away. It’s normal to be slow or unreliable about something you don’t do often. Inexperience and inability are not the same thing, and it’s unfair to people to conflate them. Gordon Bess’s Redeye for the 21st of September, 1970, got rerun the 1st of February. And it’s another in the theme of people getting basic mathematics wrong. And even more basic mathematics this time. There’s more problems-with-counting comics coming when I finish the comics from the past week. Gordon Bess’s Redeye for the 21st of September, 1970. Rerun the 1st of February, 2017. I don’t see why they’re so worried about counting bullets if being shot just leaves you a little discombobulated. Dave Whamond’s Reality Check for the 1st hopes that you won’t notice the label on the door is painted backwards. Just saying. 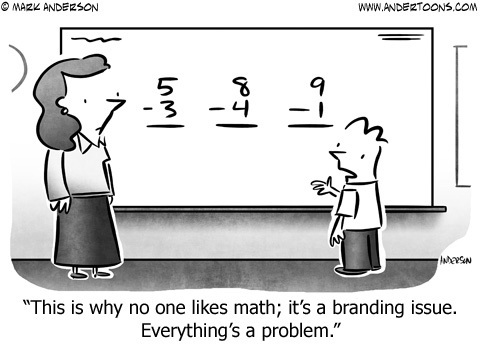 It’s an easy joke to make about algebra, also, that it should put letters in to perfectly good mathematics. Letters are used for good reasons, though. We’ve always wanted to work out the value of numbers we only know descriptions of. But it’s way too wordy to use the whole description of the number every time we might speak of it. Before we started using letters we could use placeholder names like “re”, meaning “thing” (as in “thing we want to calculate”). That works fine, although it crashes horribly when we want to track two or three things at once. It’s hard to find words that are decently noncommittal about their values but that we aren’t going to confuse with each other. So the alphabet works great for this. An individual letter doesn’t suggest any particular number, as long as we pretend ‘O’ and ‘I’ and ‘l’ don’t look like they do. But we also haven’t got any problem telling ‘x’ from ‘y’ unless our handwriting is bad. They’re quick to write and to say aloud, and they don’t require learning to write any new symbols. Later, yes, letters do start picking up connotations. And sometimes we need more letters than the Roman alphabet allows. So we import from the Greek alphabet the letters that look different from their Roman analogues. That’s a bit exotic. But at least in a Western-European-based culture they aren’t completely novel. Mathematicians aren’t really trying to make this hard because, after all, they’re the ones who have to deal with the hard parts. Bu Fisher’s Mutt and Jeff rerun for the 2nd is another of the basic-mathematics-wrong jokes. But it does get there by throwing out a baffling set of story-problem-starter points. Particularly interesting to me is Jeff’s protest in the first panel that they couldn’t have been doing 60 miles an hour as they hadn’t been out an hour. It’s the sort of protest easy to use as introduction to the ideas of average speed and instantaneous speed and, from that, derivatives. Since it is mid-April, and most of the comic strips at Comics Kingdom and GoComics.com are based in the United States, Comic Strip Master Command ordered quite a few comics about taxes. Most of those are simple grumbling, but the subject naturally comes around to arithmetic and calculation and sometimes even logic. Thus, this is a Tax Day edition, though it’s bookended with Mutt and Jeff . Bud Fisher’s Mutt And Jeff (April 11)	— a rerun rom goodness only knows when, and almost certainly neither written nor drawn by Bud Fisher at that point — recounts a joke that has the form of a word problem in which a person’s age is deduced from information about the age. It’s an old form, but jokes about cutting the Gordion knot are probably always going to be reliable. I’m reminded there’s a story of Thomas Edison giving a new hire, mathematician, the problem of working out the volume of a light bulb. Edison got impatient with the mathematician treating it as a calculus problem — the volume of a rotationally symmetric object like a bulb is the sort of thing you can do by the end of Freshman Calculus — and instead filling a bulb with water, pouring the water into a graduated cylinder, and reading it off that. Sandra Bell-Lundy’s Between Friends for the 12th of April, 2015. The link will likely expire around the 12th of May. Sandra Bell-Lundy’s Between Friends (April 12)	uses Calculus as the shorthand for “the hardest stuff you might have to deal with”. The symbols on the left-hand side are fair enough, although I’d think of them more as precalculus or linear algebra or physics, but they do parse well enough as long as I suppose that what sure looks like a couple of extraneous + signs are meant to refer to “t”. But “t” is a common enough variable in calculus problems, usually representing time, sometimes just representing “some parameter whose value we don’t really care about, but we don’t want it to be x”, and it looks an awful lot like a plus sign there too. On the right side, I have no idea what a root of forty minutes on a treadmill might be. It’s symbolic. I might turn this into a regular feature. 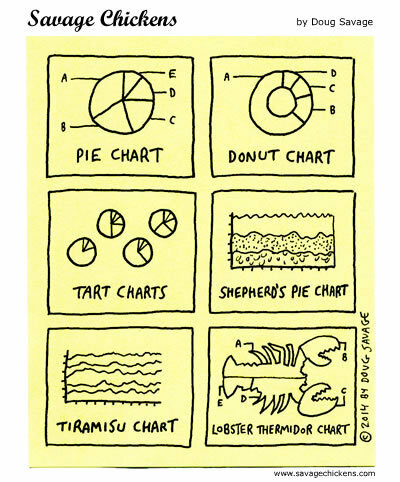 A couple more comic strips, all this week on gocomics.com, ran nice little mathematically-linked themes, and as far as I can tell I’m the only one who reads any of them so I might spread the word some. Bud Fisher’s Mutt and Jeff is in reruns, of course, and shows a random scattering of strips from the 1930s and 1940s and, really, seem to show off how far we’ve advanced in efficiency in setup-and-punchline since the early 20th century. But the rerun from the 17th of March (I can’t make out the publication date, although the figures in the article probably could be used to guess at the year) does demonstrate the sort of estimating-a-value that’s good mental exercise too. I note that where Mutt divides 150,000,000 into 700,000,000 I would instead have divided the 150 million into 750,000,000, because that’s a much easier problem, and he just wanted an estimate anyway. It would get to the estimate of ten cents a week later in the word balloon more easily that way, too. 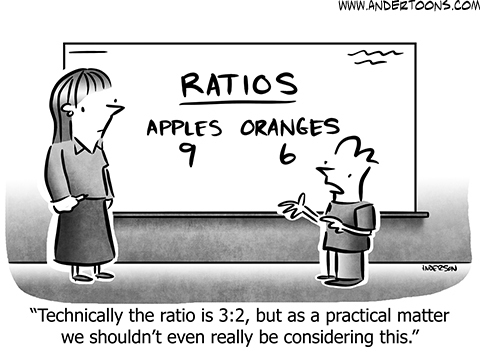 But making estimates and approximations are in part an art. But I don’t think of anything that gives me 2/3ds of a cent as an intermediate value on the way to what I want as being a good approximation. There’s nothing fresh from Bill Whitehead’s Free Range, though I’m still reading just in case.